Everyone uses compact toilets or corner toilets to save some space – but not many people know you can achieve the same results with the best wall mounted toilet as well. 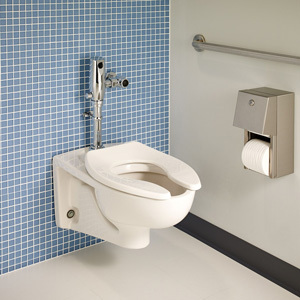 Did you know that a wall-mounted toilet can save you 10 inches, to say the least, by propping the tank on the wall? This will not only give the impression of a bigger bathroom, but it will also offer more storage space under the toilet. Still, since wall-hung toilets are difficult to install as they are, you need a guide that will help you understand the basics. Here are some tips and some floating toilet reviews that might be useful for you. 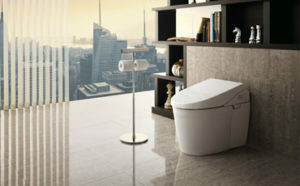 Dimensions : 23.8 x 15.8 x 17.5"
Dimensions : 30 x 19.5 x 29.5"
Dimensions : 7 x 4 x 8"
Dimensions : 26.5 x 16.5 x 13.2"
When it comes to toilets, Kohler has always been recognized as one of the main manufacturers in the US, and they never disappoint with their mid-price range products. This toilet is obviously no exception. 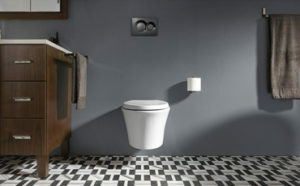 Having a comfortable elongated seat but still retaining its compact size, this toilet is perfect for a smaller bathroom. Plus, the fact that the tank is incorporated into the wall assures even more space. The bowl in itself features a skirted construction that is resistant to germs and fairly easy to clean. Plus, the dual flush allows you to choose from a 0.8-gallon flush and a 1.6-gallon option. This is a great alternative for conserving water if you only leave liquid waste in the bowl. Since it has a mounting system, you can choose any height that you want from 15-3/8 inches and 28-1/2 inches. The hardware system is tucked inside the wall, making it relatively easy to clean. Toto brand knows exactly how to create a high-quality product that lasts through the years. This model is one of their budget options, and while it may not have the signature SanaGloss coating, it is still fairly easy to clean. While featuring an elongated bowl, this toilet doesn’t occupy more than a round bowl would. This makes it perfect for bathrooms where space is limited – particularly since it also leaves enough room space. This toilet also features a dual flush system, allowing you to choose between a 0.9-gallon flush and 1.6 gallons of water. This makes it an environmentally-friendly option – and obviously, an option that will save you on the water bill. 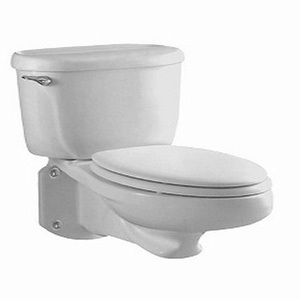 American Standard is, as you have probably realized by this point, the staple in American sanitary ware. 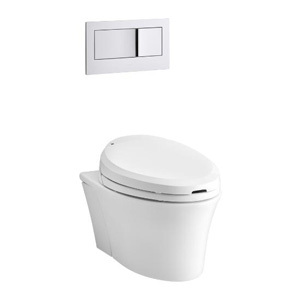 Having at a reasonable price, this two-piece wall hung toilet looks fairly much like a traditional toilet – only that you hang it onto the wall. 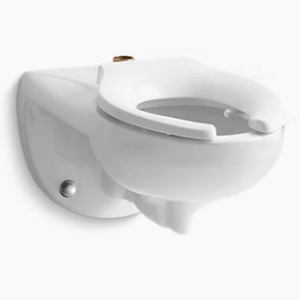 Unlike most toilets of this type, the tank does not go inside the wall – making this American Standard model a good choice if you don’t want to start remodeling or taking down walls. Featuring a sturdy vitreous china construction and an elongated seat, this is the perfect toilet seat to sit on when nature finally calls. Plus, since the associated tank features a siphon jet, the bowl is also easy to clean. However, the trap way is fully glazed – which means that it’s fairly non-stick as it is. It may not have a dual flush system but considering that it only uses 1.6 gallons of water, it is fairly water efficient. 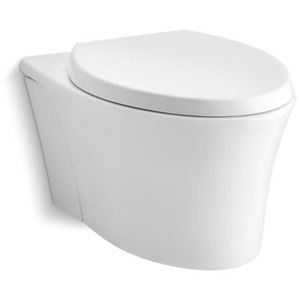 Duravit is fairly new on the market, but those who have used this toilet seat have praised its great quality. 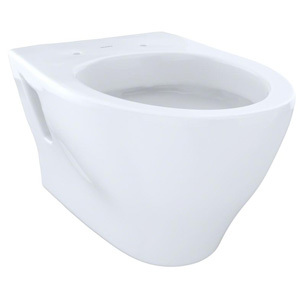 Made from vitreous china in an elongated form, this toilet is not only comfortable but also durable. 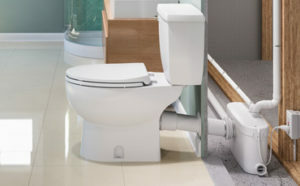 The toilet bowl in itself is very easy to install; the only work you’ll have to do it with the water tank since it has an in-wall construction. However, the inside of the tank is easily accessed once you remove the panel – making it easy for you to reach in case there’s a malfunction. Featuring a dual-flush system, this toilet allows you to choose between a semi-flush and a full flush – therefore allowing you to save on the water bill. For pricing purposes, the toilet seat is not included within the price and is sold separately. However, once you see the seat, you’ll understand why it doesn’t really come cheap. It’s a luxury brand, so it’s clear enough that every product is of high quality. Kohler strikes again with a high-quality product sold at a budget price. This environmentally-friendly toilet will allow you to save on water while not compromising the power of the flush. One full flush uses 1.6 gallons of water while half flush uses 0.8 gallons – meaning that you won’t have to go for a full flush anymore when all you have is the liquid waste. The bowl is skirted and has no hidden crevices where bacteria can hide. 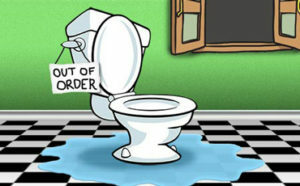 This means that this toilet is easily maintained, and you won’t have to go through hidden nooks and crannies to fix it. Plus, since bidet pipes and mounting brackets are hidden from sight, it’s also aesthetically pleasing to look at. 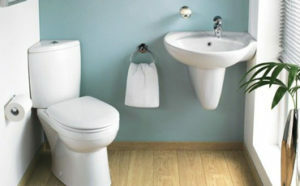 Last but not least, in order to make it as comfortable as possible, this toilet seat features an elongated shape. At the same time, the bowl is fairly compact. On average, this toilet seat is around twelve inches smaller than the longest toilet bowl from the Kohler line. 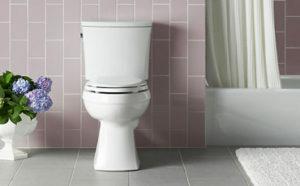 This toilet is an even more compact Kohler option that will provide you with extra space below the bowl. 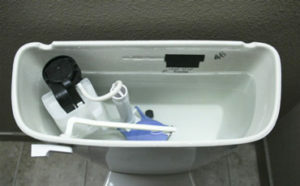 Paired with a correct flushometer, this can perform superiorly at both 1.28 gallons-per-flush and 1.6 gallons-per-flush. Each flush is strong, and it will not leave any waste behind. 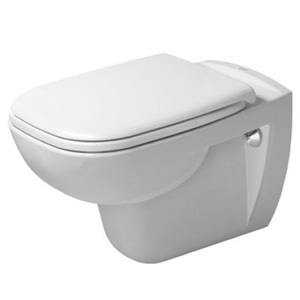 This toilet is fully glazed, meaning that it requires little maintenance. Just a weekly wipe and an inner toilet brush cleaning every now and again. Plus, at 2-1/8 inches, the trapway is fairly large – which means that the chances of it getting clogged are close to zero. 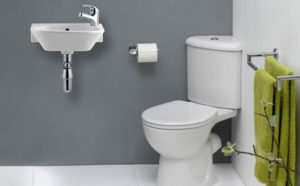 The toilet seat is not included, but most users recommend that you pair it with the Kohler bidet seat. This will provide maximum performance and a superior sensation of cleanliness. Plus, since you won’t have to use toilet paper, you will be less tempted to go for the full-flush option. If you are looking for a comfortable wall mounted toilet with a less than usual design, then you might want to give this American Standard toilet a try. Featuring a slim flushometer, this one allows you to choose between a single flush and a dual flush action. The fairly powerful siphon jet action will clean any waste that has attached itself to the walls, acting together with the stick-free coating that the inner toilet has. Thanks to this, the toilet is relatively stick-free. The elongated toilet bowl is very comfortable, despite the fact that it’s much smaller compared to the average elongated toilet bowl. Paired with the right toilet seat, it will support your thighs as well, allowing you to sit like a king (or queen) on the throne. Made from vitreous china, this toilet seat was meant to be durable. It can last for 10 years – or even more – without a scratch, provided you offer it the proper maintenance. At this price, you get a fairly good quality product in return. 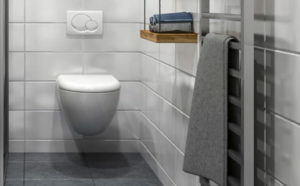 Many people shy away from wall mounted toilets, mainly because they believe they are a pain to install; however, there are certain advantages to wall-mounted toilets that might make them a much better solution for you. Here are the aspects that might make a wall-mounted toilet the go-to solution for you. 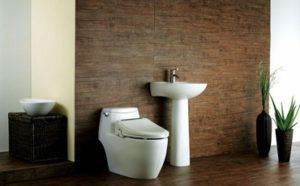 Perhaps one of the most important benefits of wall-mounted toilets is the fact that they save on floor space. They’re a good solution for small bathrooms, and the fact that they are slightly elevated above the ground level will make the bathroom seem all the more spacious. When you install a wall-hung toilet, you get to decide how high you want it to be. This way, not only can you place it at your perfect comfort level for you, but you will also have more freedom to customize your bathroom. How many times have you been triggered by the fact that you couldn’t properly clean the area where the floor and the toilet meet? 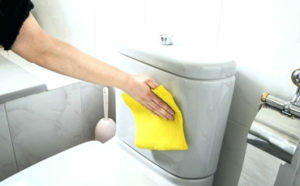 This process is tiresome since you have to scrub the area before you mop the place. With a wall toilet, however, all you’ll have to do is use the mop on the floor – since there won’t be any meeting points at the floor. It will take you 5 minutes standing as opposed to 20 minutes bent in an awkward position. Some people might see this as a disadvantage since it’s trickier to install a toilet this way. It will need a remodeling, even taking off the drywall. However, if you decide to do it, it will make your bathroom look all nice and sleek, with a lot of spare room to it. Wall-mounted toilets represent an attractive option for many people – simply because they look much better than a traditional toilet. 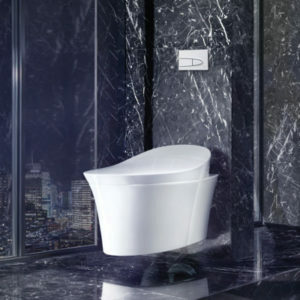 Plus, they have a more minimalist design, giving you more options to design your bathroom. While the prices for wall-hung toilets have dropped with time, they are still slightly more expensive than your traditional toilet – and this doesn’t include the money you have to pay to install it. However, they will offer a contemporary look to your bathroom. 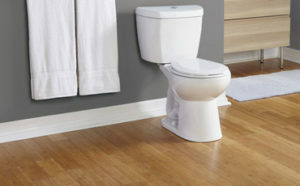 You have to be aware of the fact that installing a wall-hung toilet will require a fair amount of remodeling. The toilet in itself is easily attached, but the matter of concern here is the tank that has to go inside the wall. Make sure that your wall is also supportive enough to hold the toilet. A lot of people are afraid that they won’t be able to access the tank in case things go wrong – but this is because they don’t know you can lift the actuator plate to get in. Manufacturers kept in mind the fact that things might clog or need fixing – so they ensured they left enough space to permit access in a bind. 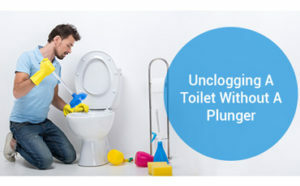 In a way, you could say that they are as easy to fix as traditional toilets – if not even easier. How much water does a certain toilet use when it’s flushing? Does it have a system that uses water more efficiently, or does it work with a traditional system? Similarly, you may want to opt for toilets that have dual-flushing systems. Classic, old-model toilets mostly have only a single-flush system – however, such a flush is generally unnecessary when it comes to dealing with just liquid waste. Furthermore, choose something that has an effective, strong flush. The reasoning behind this is quite simple: if the first flush doesn’t go through, then you’ll have to flush a second time. This won’t really help you in your water-saving attempt. 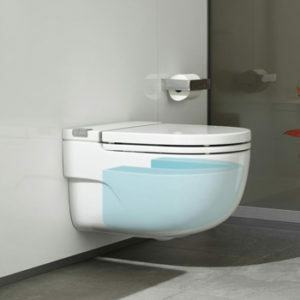 Granted, a wall-hung-toilet gives you the freedom to attach it at any height that you want. However, depending on how tall the toilet itself is, you might not be able to place it as low as you might want. Some wall-hung toilets have a self-cleaning surface, and others have LED lights that allow you to find your toilet in the middle of the night – without having to turn on the lights. Find out what is it that makes your toilet special. Wall mounted toilets represent a type in itself since they are basically “those toilets that you can hang on the wall.” However, these toilets can also be found in various shape and sizes. First of all, wall-mounted toilets can be round or elongated. A round model will save a lot of space, making it a good option for small bathrooms. On the other hand, an elongate toilet might be a more comfortable solution since it gives you more support and thigh space. You can also go for wall mounted toilets that also double as corner toilets, although they are much more difficult to find. They represent a good solution for bathrooms that are very small – such as stalls or closet-sized home bathrooms. Wall mounted toilets are not only something that will save you floor space but will also make your overall bathroom look more stylish. However, it takes a lot of research to find the best wall mounted toilet – which is why you always need to be particularly selective in your choices. Read some floating toilet reviews and find out what clients liked about them – or disliked if that’s the case. Are they the appropriate size for your bathroom? Do they have a strong-enough flush to pump away all the waste? What about their features? Are they plain of toilets or do they have something that makes them distinct? 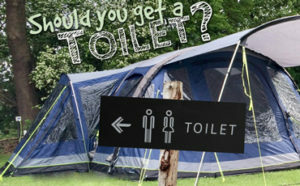 Hopefully, this guide helped you make your choice and you managed to find the perfect toilet and the perfect solution for your needs.